Our love for adventure begins in our youngest years, & Regatta is an outdoor brand with this ideology at its core. Since 1981 Regatta has been the brand of choice for familial thrill seekers and outdoor lovers. Creating the highest quality outerwear, at perfectly affordable prices, making it so easy to get the whole family kitted out correctly for wilderness excursions. Or even just wandering through the park on a blustery Winter's day. Founded in 1981, Regatta started with just twelve adventure-seeking employees who loved the great outdoors. This mutual passion inspired them to create clothing that would help them and others enjoy the world outside the front door. Popular with thousands of Britons, Regatta makes footwear, clothing and accessories for ramblers, hikers, bikers, campers, backpackers and adventurers of every ilk. Twice awarded the Queen’s Award for Enterprise, this brand has made its mark on the British clothing landscape. Its long-lasting and durable products include jackets, fleeces, soft-shells and trousers and are perfect for any outdoor adventure. 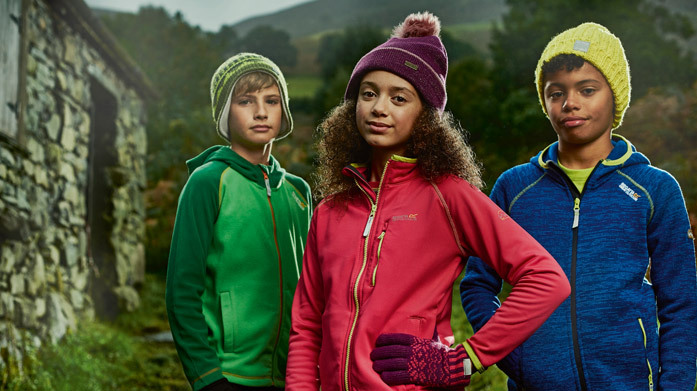 Discover fun and functional clothes and accessories for kids at BrandAlley, where you’ll find the UK’s leading adventure outfitters at amazing prices. Find great deals on kids windproofs, waterproofs and more today.